The compact UV-2600/2700 is a universal, research- grade spectrophotometer that can be used in a wide range of fields, and easily expanded to suit the measurement objective. 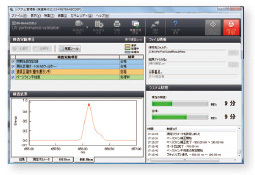 Validation software is provided as standard for both instruments, so equipment performance can be easily checked in daily inspections and when data accuracy becomes a concern. By installing the ISR-2600Plus two-detector integrating sphere, the 300 nm to 1100 nm wavelength range of conventional models can be extended to 1400 nm. As a result, the UV-2600 can accommodate measurements of solar cell anti-reflective films and polycrystalline silicon wafers. This is a transmission measurement of polycrystalline silicon. 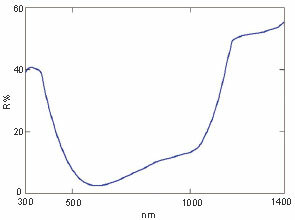 Since the system is capable of measurements to 1400 nm, the transmission characteristics of the band gap region (near 1000 nm) are clearly evident. This is a reflection measurement of an anti-reflective film. 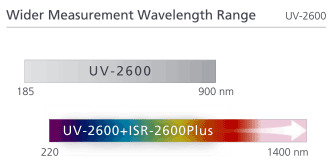 With relative reflection measurements, the system can measure from the ultraviolet region up to the near-infrared region, so the suppressed reflectance in the visible region is clearly evident. 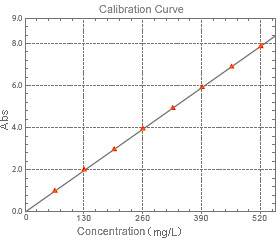 The figure on the right shows the relationship between the absorbance and the concentration of an aqueous potassium permanganate solution. Good linearity is evident to 8 Abs. 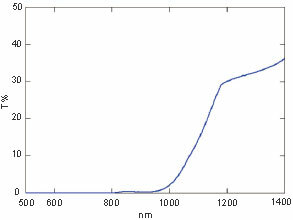 This spectrum is measured from an aqueous KMnO4 (potassium permanganate) solution. 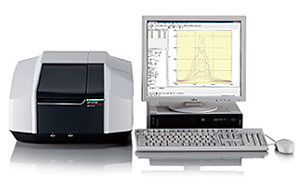 Unlike conventional models, this system is capable of high-level absorbance measurements. have been developed for Shimadzu's holographic technology. By optimizing the etching process, we have successfully manufactured extremely low stray light diffraction gratings while maintaining high efficiency. 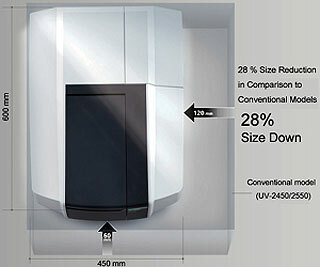 With this newly designed optical system equipped with a double Lo-Ray-Ligh monochromator, the UV-2700 achieves unparalleled ultra-low stray light levels. 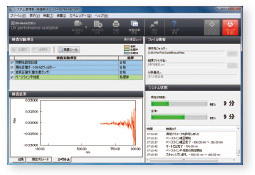 Validation software assists with equipment performance checks and the logging of such checks. By including it as standard with the UV-2600/2700, easier instrument checks are achieved. Equipment performance can be easily checked in daily inspections and when data accuracy becomes a concern. Inspection results can not only be printed, but also saved to a file, with results called up later for　confirmation. Inspection conditions for each periodic and routine inspection can be saved as a file, and then called up for use. 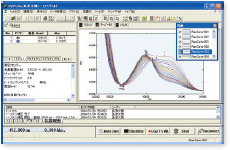 UVProbe is an all-in-one software package equipped with a multitude of functions to enable easy analysis from measurement to reporting. Additionally, functions for supporting GLP/GMP, such as security and audit trail functions, have been enhanced.